Super Ténéré This bike has many options, call sales for details and pricing 1-800-767-7394. come view this bike, very nicely done. INTERCONTINENTAL ADVENTURE AWAITS All it takes is one look at the rally-inspired Yamaha Super Ténéré and the wonder lust sets in. And there's no stopping it with a super compact parallel twin engine with a unique 270 degree firing order, a wide ratio six-speed transmission, YCC-T (Yamaha Chip Controlled Throttle)—optimum throttle control and acceleration, traction control, Anti-lock Braking System (ABS), adjustable seat height and the list goes on. Dream big because the Super Ténéré will take you there. Handlebar brush guards are standard equipment. The optional, flexible luggage system design has three possible set-ups: standard with no top case / side bags, top case installed, and side cases installed. Genuine Yamaha top case and side cases designed for adventure touring are available as accessories. These accessories were included during the design of the motorcycle so as to enhance the look of the bike. 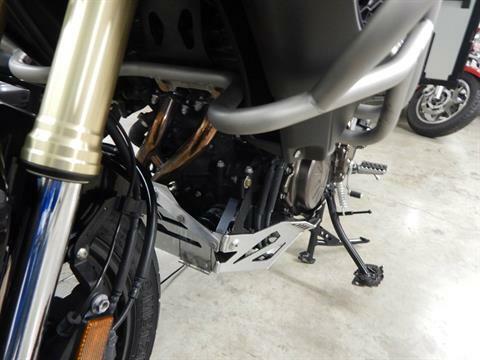 Body components help direct cooling airflow to critical areas of the bike. R1 style turn signals and reflectors. The all-new steel frame is designed to reduce rider fatigue during long rides. Using a steel main frame offers the best balance of strength and flexibility, one good at absorbing jolts from uneven road surfaces. The engine is a stressed member of the frame. Locating the crankshaft low and close the foot pegs gives the bike a remarkably light feel, even off road. The ABS and Unified Brake System work together to help prevent wheel lock during braking. This new system allows the rider to operate front and rear brakes together by simply pulling the front brake lever, especially helpful when riding while standing on the pegs. Applying the rear brake first overrides the Unified Braking System to provide traditional separate front and rear brake control. Adjustable pre-load suspension allows the rider to adjust for varying loads or a passenger. The forks are compression and rebound adjustable and the rear shock is rebound-damping adjustable as well. A generous 6-gallon fuel tank allows for long touring with less down time for fill-ups. 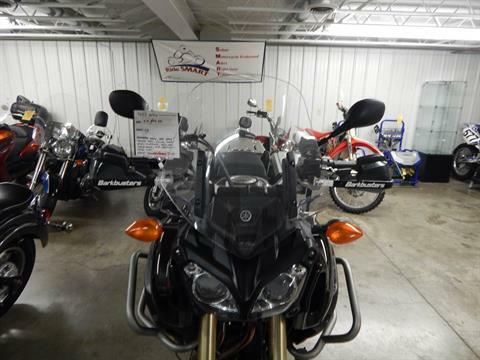 The Super Ténéré comes equipped with an adjustable seat height. 1 inch of adjustment provides a low height for shorter riders or a roomier riding position for taller riders in the high position. Front and rear hydraulic discs are both wave-type for great performance on or off road. The grooved foot pegs show Yamaha’s attention to detail. 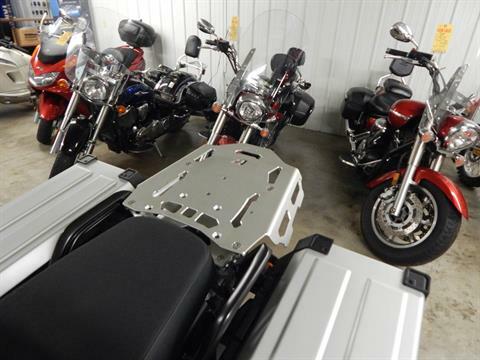 While the rider is seated, rubber cushions provide excellent comfort. When the rider stands to tackle more technical riding conditions, the rubber compresses, letting the rider’s boots contact the metal foot peg surface. The all-new 1,199 cc parallel twin liquid-cooled engine features a unique 270° crank for superior traction because both pistons fire so closely together. It’s almost like having a big-bore thumper without the uncomfortable vibration. Compact engine design uses a dry-sump oil supply inside the crankcase, and side-mounted radiator for surprising narrowness. 8-valve cylinder head optimizes the fuel charge for spirited performance. The cylinder head cover is ultra-lightweight magnesium to help centralize mass. A two-axis primary balancer smoothes out engine vibration for all-day riding comfort. Forged aluminum pistons and carburized connecting rods for durability and performance. 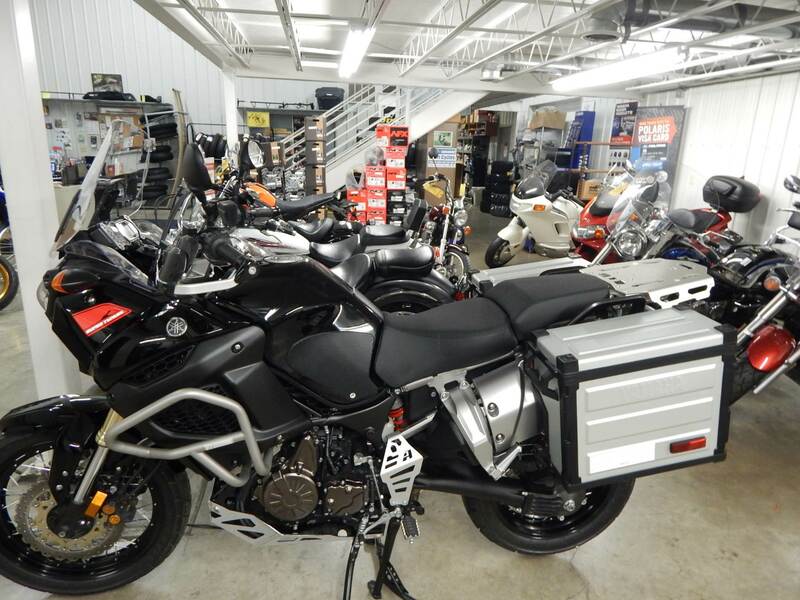 Downdraft twin bore fuel injection system with 12-hole injectors is tuned for off-road adventures, and is equally at home on long stretches of open highway. Proven YCC-T fly-by-wire technology is matched to an all-new traction control system, which regulates ignition timing and fuel injection volume based on rear wheel spin. Three rider-selected modes are available to match conditions and the rider’s preference. Yamaha D-Mode has two settings: “T-mode” for Touring and general riding, giving a softer response; “S-mode” for Sport riding when the rider wants the most performance possible. Wide-ratio 6-speed transmission has gear ratios optimized for everything from slow dirt roads to higher speed sport riding. The low-maintenance shaft drive is clean and reliable with a compact rear axle gear case thanks to its hypoid gear design. 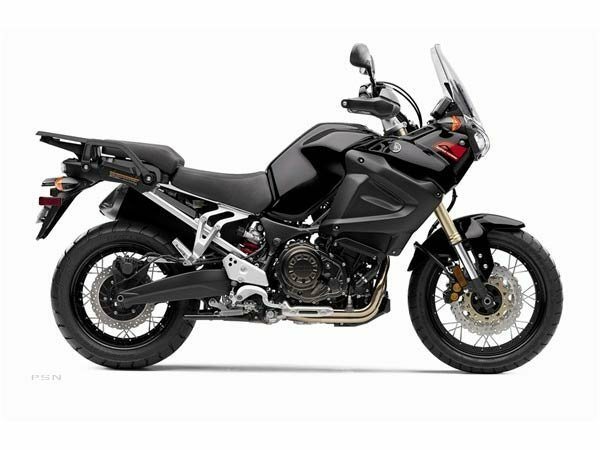 The Super Ténéré is built for adventure, with an all-new, exceptionally compact 1,199 cc parallel twin with a unique 270° crank for excellent torque and traction. Engine mass is kept low for excellent handling. Narrow 2-cylinder inline engine is slim and compact for carving tight lines in twisty mountain roads. Wide-ratio 6-speed transmission has the right gear, whether on the open highway or off-road. Twin downdraft fuel injection with YCC-TTM (Yamaha Chip Controlled Throttle) delivers optimum throttle control and acceleration. Two-position “D-Mode” (Drive Mode) throttle-response mapping for rider preference. Traction control lets the rider get on the gas with more confidence. It regulates ignition timing and fuel injection based on wheel spin. 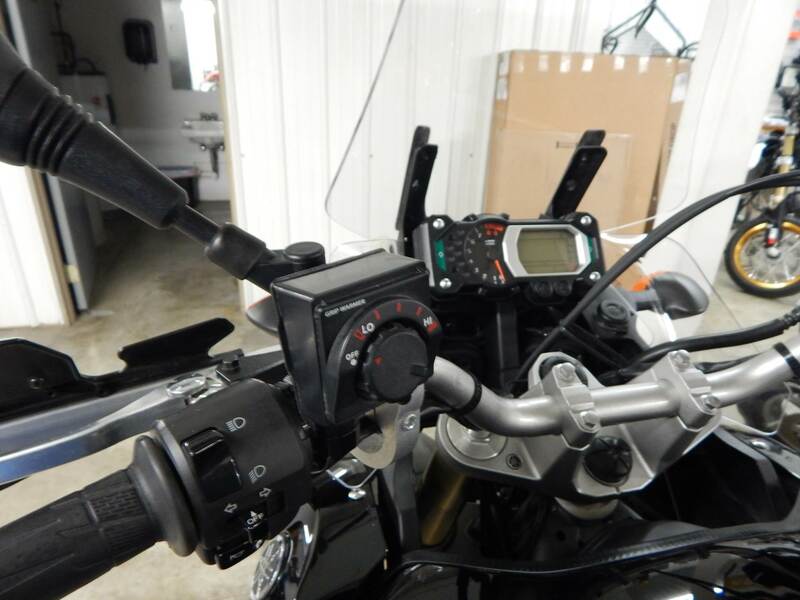 Three modes are available to match rider preference, including off. Super Ténéré has both an Antilock Braking System (ABS) and Unified Braking System. With the Unified Braking System, squeezing the front brake alone also provides some rear-wheel braking; pressing the rear brake first overrides the Unified Braking System for traditional separate front and rear braking action. Whether riding across town or crossing a continent, rider comfort and convenience are important. 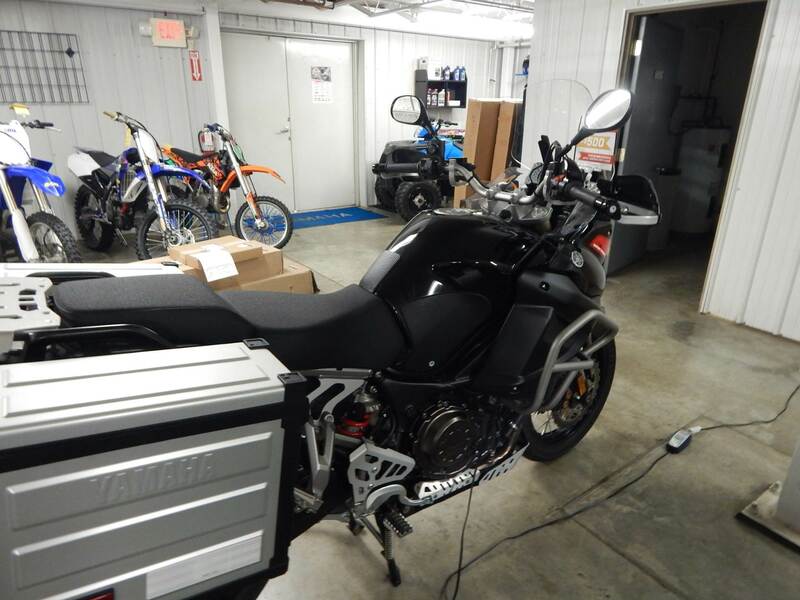 Super Ténéré delivers, with an adjustable seat height, tunable front and rear suspension, low-maintenance shaft drive, and more. Special spoked wheels carry tubeless tires. Multi-function carrier system on back is ready for luggage and touring accessories.